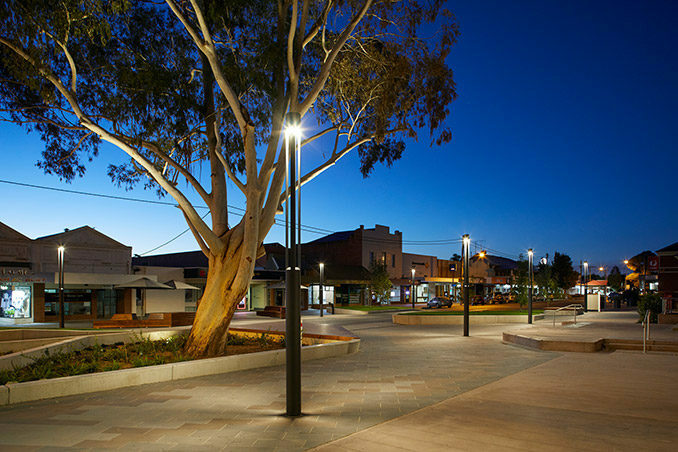 Victoria Square, Kerang is a landmark project for the regional shire of Gannawarra in northern Victoria, Australia. Previously dominated by vehicle movement and car parking, Hansen Partnership’s subtle urban renewal approach to this streetscape project successfully transforms the regional township’s main street into a pedestrian space. Underpinned by an awareness and sensitivity to ‘localness’, with a goal of reimagining the centre of this thriving regional town as a place of civic pride and community gathering, this project is meaningful in shifting attitudes in relation to public space and urban identity in regional Victoria. 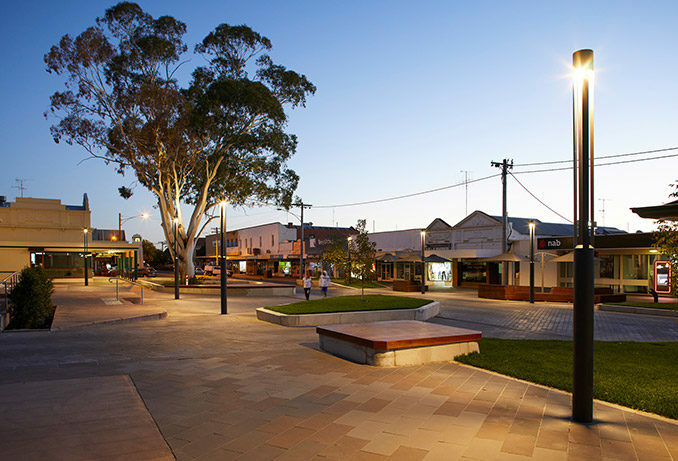 The design and delivery of Victoria Square, Kerang has been realised over a lengthy period of urban strategic study, community participation, engagement and design investigation. 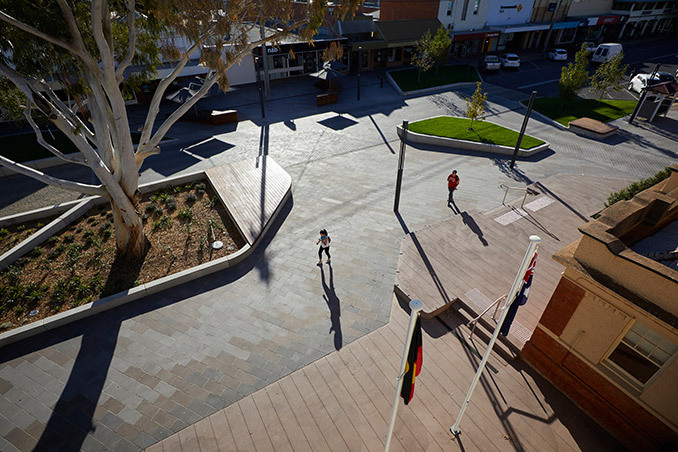 Underpinned by a precinct masterplan prepared by Terroir in 2014, Hansen Partnership prepared a concept plan for Victoria Street with a focus on a central square associated with key civic buildings and functions. 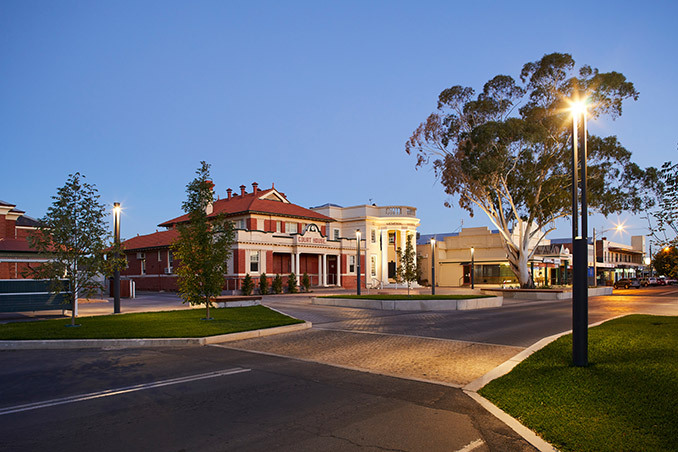 A feature of the spatial design has been the ‘peeling back’ of layers of dated (and sometimes redundant) infrastructure, to reveal the proud ensemble of civic buildings fronting the space including the Shire Office (1920s), the Kerang Courthouse (1890s) and the Kerang Post Office (1900s). In this regard, the beauty of the project lies in the display of key architectural assets (which are defining in the township), whilst creating a new public space supporting pedestrian priority. The principal aim of the concept plan was the creation of a textured functional ground plane supported by ‘pods’ of greenery to encourage respite and shape paths of pedestrian maneuverability across the precinct. These pods are also designed to frame views towards key architectural elements within the panorama. 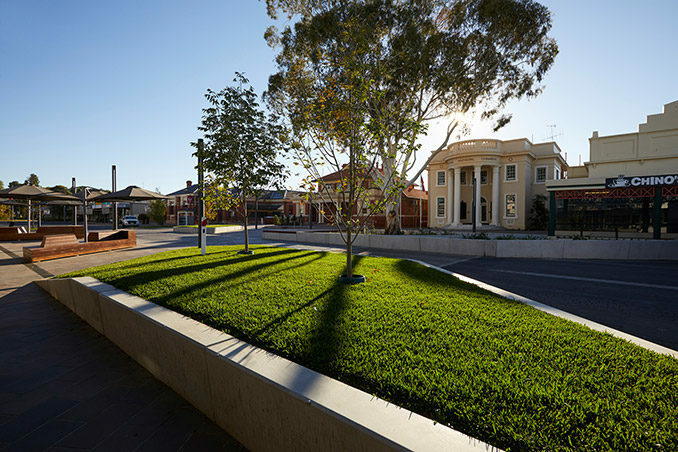 Building on the tradition of the agricultural landscapes that surround Kerang, pavement design, plant materials and furnishings have been designed to reinforce the notion of the centre of town as an ‘oasis’ amid a context of drylands and hard stand. The composition of the site plan and the relative approach to material selection has been arranged to correspond to the functional attributes of the space and the relationship to the key civic buildings abutting it. An elevated platform influenced by the concept of ‘the veranda’ connects the three stately civic buildings and provides an overview of the space. The threshold serves as the meeting place for various civic and municipal functions. 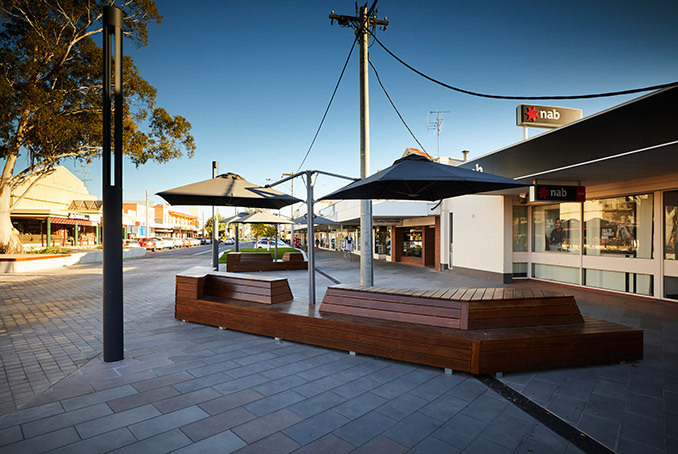 An open flush pedestrian space framed by grassed seating pods and decks, shade structures and a key established Manna Gum (Eucalyptus viminalis) of significance in the street view. These spaces reinforce the parallel movement to either side of Victoria Street. Achieving a successful pedestrian transformation in regional towns in Victoria (and in Australia more broadly) is a particularly challenging proposition which requires courage and fortitude. On this occasion, a small town has made a particularly ‘big’ statement about its pride in its people and public space. 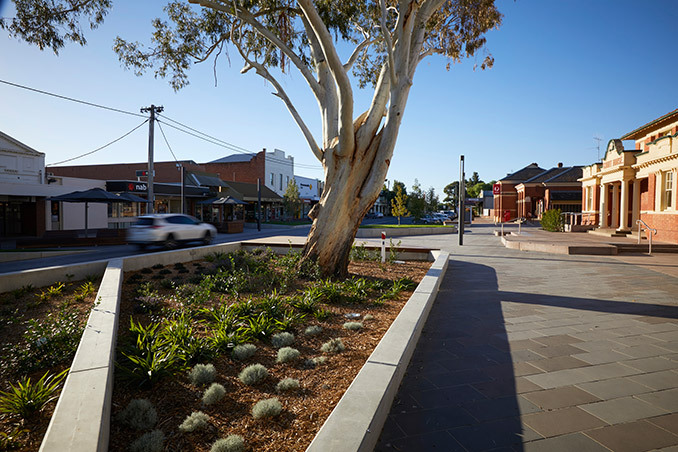 By successfully revealing the showpiece of its civic architectural ensemble and creating an attractive new forecourt – the Shire has created a paradigm shift in the way its people (residents and visitors alike) perceive and use the space. Judging from community, trader and visitor comment – the project heralds the urban renewal of important small town centres of this kind.